Home STUDIO Available giclee prints and photography FEATURE OF THE DAY at ZAZZLE….and a floral pendant special! FEATURE OF THE DAY at ZAZZLE….and a floral pendant special! YIPPIE!! I’m so excited!!! I was up all night working on finishing this design to make available on Tshirts etc at Zazzle, and lo and behold, no more than 2 hours after I submitted my design I got this letter from Zazzle below!! Considering how many kazillions of submissions they get daily, I thought this was pretty darned cool ! CLICK THE LETTER BELOW AND GO TO “TODAYS BEST” TO SEE MY MUG DESIGN ON THE HOMEPAGE! The pendant measures 2″ long, has a sterling bail and a black cord with sterling clasp is included!!! Teeny mango colored crystals stud the surface for that perfect bit of glitz!!! The flowers are all so teeny and detailed and were eye crossers to be sure ..lol The stems below the “water” are added to the back side of the vase to give it beutiful depth! I am offering this beauty as a Friday SPECIAL the a ridiculously low price of $58.00 which includes the shipping to US destinations. I hope you all have a super weekend my friends!!!! Wow… your technique just keeps getting better and better! I love the pendant and t-shirt! I just ordered a t-shirt for Tai’s birthday – not in red, but lemon so it will definitely do well in the D.C. humidity and heat! Hey there girlfriends!! Thanks everyone for the sweeeeeeeeeeeeeet comments!!! 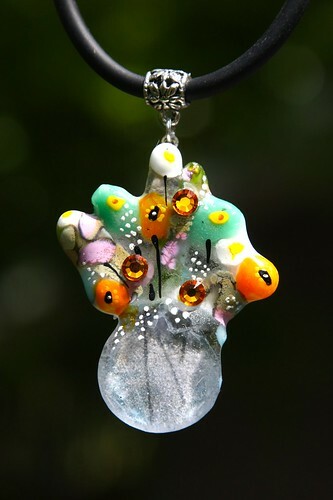 I am loving working on these glass pendants and the graphic design has become addictive too!!! I wish I had unlimited time to do JUST ART!!! KarenThanks so much for ordering a Tshirt!!! OMG you need to have someone at the Bday party take a photo for me!!! It will be gorgeous in lemon! Mz Brenda in the comments above got the pendant on this post but more are on the way!! Woo Hoo!! !